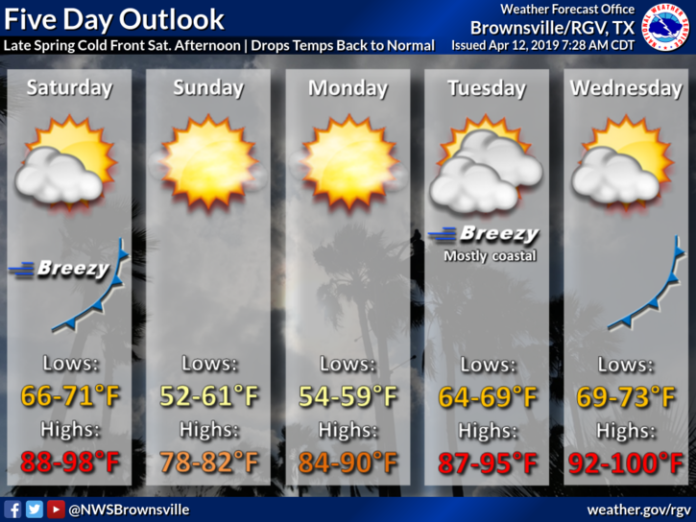 Friday will be warm and partly cloudy with light to moderate winds in the Rio Grande Valley, according to the National Weather Service in Brownsville. Patchy to dense fog east of Highway 281 is expected to clear by later this morning. High temperatures will top off in the upper 80s and possibly the lower 90s. McAllen will be 90 and Brownsville 87. South Padre Island is expected to reach 80. Expect a warm, breezy day Saturday with temperatures ranging between 88 and 98 degrees with lows in the upper 60s. A cold front will arrive Saturday afternoon that will drop temperatures back to near normal for this time of year into early next week. On Sunday, highs will be around 80 degrees and lows will range between 52 and 61. Temperatures will begin to warm up mid-week. On Wednesday, temperatures could be in the upper 90s.